How many times can a guy draw up ‘Spider 2 Y banana’? Jon and Jay Gruden sure use up a lot of napkins at Hooters when they talk football. Think the Gruden brothers might like talking a little football? “Oh, yeah, we go all night,” Washington coach Jay Gruden told ESPN of sit-downs with his brother Jon, the Raiders coach. “The napkins are flowing. We go to Hooters, have some wings and borrow about 14,000 napkins and draw on them. 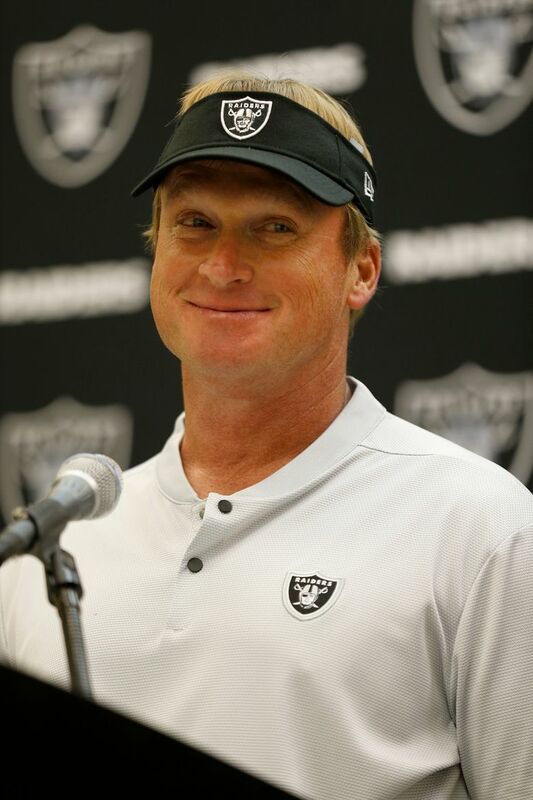 … In the Gruden household, there’s really nothing else we can talk about. We don’t know anything else. The Washington Nationals have been 4-4, 5-5, 6-6, 9-9, 10-10, 16-16, 17-17, 42-42, 43-43, 45-45, 46-46, 47-47, 48-48, 49-49, 51-51, 52-52, 53-53, 60-60, 61-61, 62-62, 63-63, 64-64, 66-66, 67-67, 68-69 and 69-69 this season. In a related story, the Nats have just been named the official baseball team of the Indianapolis 500. Oregon State, which got paid $1.7 million to visit Ohio State for its football opener and take a 77-31 pummeling. Tigers analyst Rod Allen allegedly assaulted play-by-play broadcaster Mario Impemba, grabbing him from behind, but Allen’s agent says it didn’t happen. Flummoxed Elias Sports Bureau types can’t decide whether to credit Allen with a blown hold or a no-hitter. The Rockies beat the Giants 5-3 on Wednesday behind a trio of solo homers by shortstop Trevor Story, one estimated at 505 feet. Or as the feat is now known in Denver, a three-Story job. Wisconsin’s football program has installed napping pods for players in the locker room, ESPN reported. Kansas, not to be outdone, immediately scheduled book-and-blankie days. Baltimore motorists are the worst in the nation, according to a new study. No wonder the Orioles barely cracked the top 25 when it comes to runs driven in. How do you smell relief? Mariners relief pitchers have posted a 5.19 ERA in seventh innings this season. Or as it’s otherwise known in these parts, the seventh-inning stench. Angels phenom Shohei Ohtani slammed two home runs just hours after doctors recommended he undergo Tommy John surgery on his pitching elbow. No need for Barry Bonds surgery, though. Patriots fans were incensed upon discovering that some Dunkin’ Donuts outlets in Massachusetts were serving drinks in cups featuring a huge Eagles logo and the words “World Champions” on them. Which makes one wonder: What are the odds of buying a set of Eagle tires in New England that are fully inflated? The head of Montreal-based Quebecor Inc. blamed the Canadiens’ failure to make the Stanley Cup playoffs for a damaging drop in the communications giant’s second-quarter ad revenues. In other words, the bottom line went from Habs into Hab-nots. The biennial World Nomad Games, featuring more than 40 sports played by Turkic nomadic peoples over the centuries, took place last week in Issyk-Kul, Kyrgyzstan.